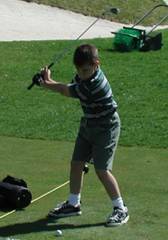 In this program, we provide young golfers with a fun opportunity to develop their skills. Giving juniors practice assignments that fit their experience, need and ability. Providing feedback on that practice assignment until those skills are sufficiently improved. Keeping a file on each junior to keep the message they hear focused and consistent. Groups are divided first by age and possibly again by skill level during the course of the camp. Lunch and refreshments are provided for each participant. We take a 30 minute group lunch break and plenty of individual drink breaks. To be certain your junior gets the most out of the camp experience, please consider their equipment. We offer the US Kids Golf line, the most versatile and technically appropriate line on the market. And we offer a complimentary fitting to help you determine the appropriate size, weight and set composition. Call us at 215-862-9045 to reserve a spot for your young golfer and to schedule a complimentary fitting. payment is made in full. Click here to contact us about availability. "Thanks so very much for the wonderful camp our son Jonathan completed with you today. You did more to improve his game in three days, than any other camp he has gone to! In fact, in the car going home today, he said that he probably learned more this week than from ANY other sports camp he has ever attended!!! Quite a big compliment from a 13 year old who has had quite a few opportunities at many, many sports camps.!!! Again, thanks so very much for the outstanding opportunity that you afforded our son, we're looking to his returning!"